Great Expectations: The First Edition, 1861 (Cambridge Library Collection - Literary Studies) (Paperback) | Broadside Bookshop, Inc. The novels of Charles Dickens (1812 70), with their inimitable energy and their comic, tragic and grotesque characters, are still widely read, and reworked for film and television. 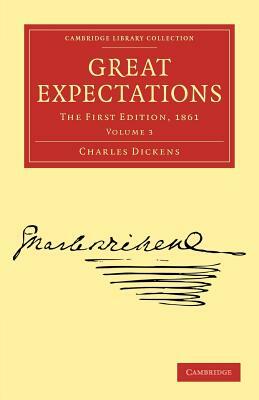 The first book edition of Great Expectations was published in three volumes in 1861. It is now reissued in the Cambridge Library Collection simultaneously with the serialised version, published in Dickens' periodical All the Year Round in 1860 1, and a volume of newly photographed actual-size colour images of the entire original manuscript. Dickens himself had the manuscript bound and presented to his friend Chauncy Hare Townshend, with whom he shared an interest in mesmerism and the occult, and in 1868 Townshend bequeathed his library (including the manuscript) to the Wisbech and Fenland Museum. Dickens scholars and enthusiasts will now be able easily to study this three-volume book edition alongside the serial and the work-in-progress, with all its deletions and revisions.